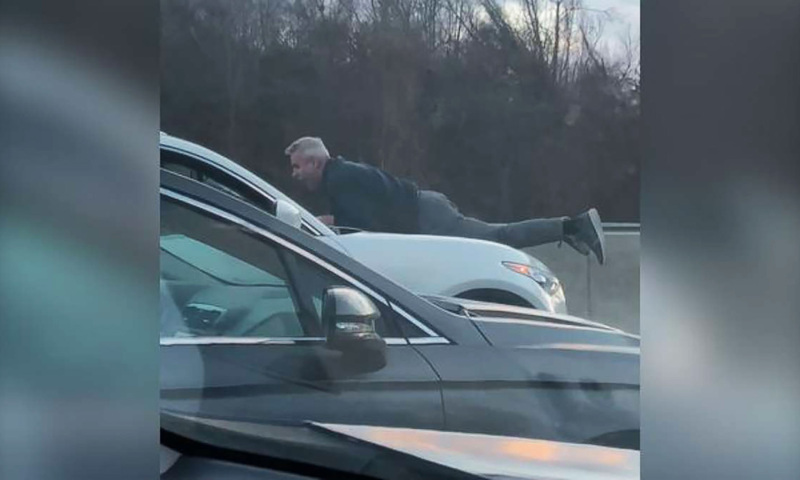 A 65-year-old man says he thought he was going to be roadkill after a rush hour road rage incident left him clinging to the hood of a man’s SUV as it hit speeds of up to 70 mph on the Massachusetts Turnpike. “I thought he was going to run me over,” Richard Kamrowski said of the wild ride that was caught on cell phone video by stunned motorists just outside Boston. The bizarre incident occurred about 4:30 p.m. on Friday, when Kamrowski, 65, and Mark Fitzgerald got into a sideswipe accident while traveling in the westbound lanes of the turnpike, also known as Interstate 90, according to the Massachusetts State Police. Following the fender bender, Kamrowski stopped in the left lane and got out of his Ford F-150 pickup truck to exchange insurance information with Fitzgerald, according to police. Fitzgerald, 37, of Ashland, Massachusetts, stayed inside of his white 2016 Infinity QX70 SUV, authorities said. “That encounter became adversarial,” police said in a statement. At some point, Kamrowski of Framingham, Massachusetts, reached into Fitzgerald’s vehicle and snatched a water bottle and then stood in front of Fitzgerald’s SUV, police said. “Fitzgerald then began driving towards Kamrowski, who subsequently jumped on the hood of Fitzgerald’s vehicle,” according to the statement from police. With Kamrowski clinging to the hood, Fitzgerald headed west on the turnpike, accelerating and stopping in an apparent herky-jerky attempt to shake Kamrowski, police said. Fitzgerald’s Infinity hit speeds of up to 70 mph as it traveled about three miles on the highway with Kamrowski holding on, police said. “I just kept telling him, ‘Stop the car! Stop the car!’ And he wouldn’t stop,” Kamrowski told ABC Boston affiliate WCVB-TV. Fitzgerald, according to police, broke the windshield with the water bottle he took from Fitzgerald’s vehicle. Several motorists tried unsuccessfully to get Fitzgerald to stop, police said. When Fitzgerald eventually got bogged down in traffic, a motorist with a permit to carry a concealed weapon approached Fitzgerald and ordered him out of the SUV at gunpoint just as troopers arrived on the scene, according to the police statement. Kamrowski and Fitzgerald were both placed under arrest. Fitzgerald was charged with assault with a dangerous weapon on a person over 60, negligent operation of a motor vehicle and leaving the scene of a property damage accident. Kamrowski was arrested on suspicion of disorderly conduct and malicious damage to a motor vehicle. They were both released on personal recognizance bonds and ordered to appear for arraignment in district court on Monday in Waltham, Massachusetts. Fitzgerald declined to comment to reporters after he was released by police, WCVB reported. Efforts by ABC News to reach him on Sunday were not successful. Kamrowski said he’s just happy to be alive. “When you’re hanging on for dear life, it’s, you know, pretty scary,” he told the station.